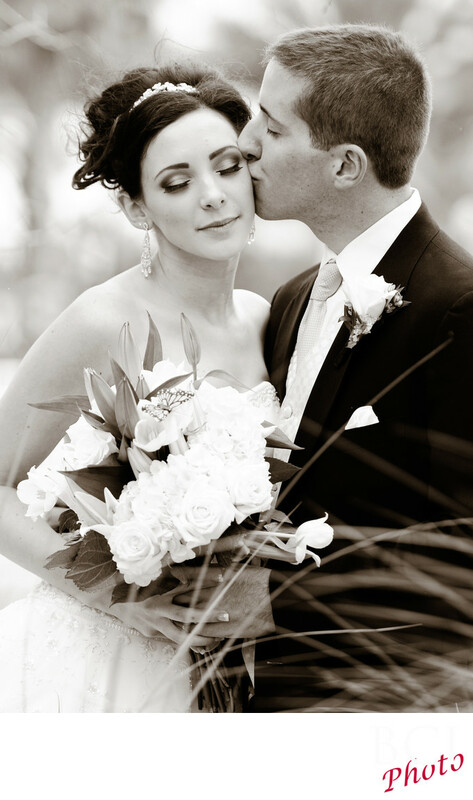 One of our favorite wedding pictures taken at Tradition Town Hall in Pt St Lucie, Florida. This shot features a tender moment caught outside the hall during our romantic portrait session which followed their church wedding. Often rushed for time, we had just enough time here to take some really nice romantic wedding portrait images outside. Here our bride and groom are in the trees and shrub covered area near the lake. Our groom gave his bride a little kiss on the cheek and we captured this tender moment. Preferring the black and white version shown here (actually chocolate flavored), as all distractions of color disappear, and only the mood, and feeling of love between our couple remains. Truly a magical wedding portrait. Want images like this for you wedding day? Why not call or text us right now! 772-336-5798. We promise we'll text you right back...well ok tomorrow if this is the middle of the night hahahaha, but seriously...hit us up right now! Available dates are limited.